As of 1 April 2013 Sumitomo merged with the Logistics & Parking System division of Sumitomo Heavy Industries (the parent company) to become Sumitomo Heavy Industries Material Handling Systems Co., Ltd (abbreviated SHI-MH). The new company combines the existing material handling equipment business, which consists mainly of cranes and bulk handling, with the logistics systems and automated parking equipment business to become a comprehensive material handling company. With this move, SHI-MH is now able to provide engineering, products and after-service covering a wider field to all of its customers. SHI-MH’s wide product range includes simple overhead cranes to heavy-duty ladle cranes for steel mills, high capacity unloaders and so on. 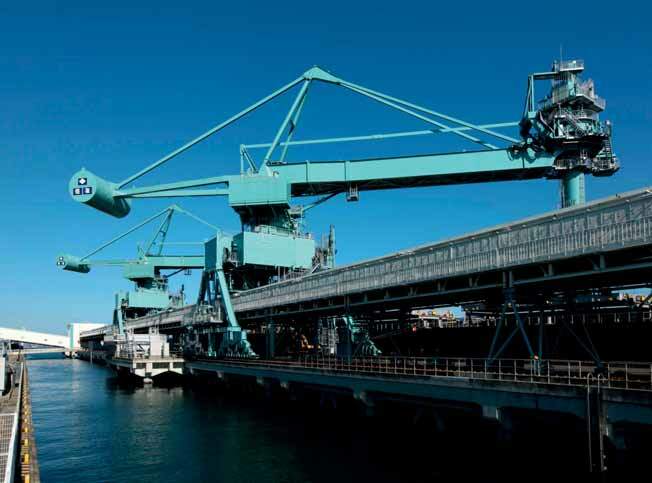 One of its main products is the continuous ship unloader (CSU), which it has been manufacturing since 1976, the first of the large number of units it has since delivered to many customers. Since 2007, SHI-MH has delivered 11 CSUs in Japan, seven to steel mills, one unit to a chemical company and three units to electric power companies. The largest of these has an unloading capacity of 2,500tph (tonnes per hour) for coal and 3,500tph for iron ore. Further SHI-MH US in the process of manufacturing two units for Taiwan and one for Indonesia. SHI-MH’s CSUs are designed to greatly minimize costs and have effectively reduced costs for total unloading facilities, unloading operations, stockyard and wharf facilities. The design places importance on environmental impact by reducing operating energy and dust and noise emissions. All these, along with the simplification of the operation of the CSU, have resulted in a high degree of customer satisfaction. SHI-MH’s CSU design is well suited for unloading a wide range of ship sizes and the hold bottom clean-up feature offers a very flexible and safe operating environment for customers. As countermeasures for large scale earthquakes and tsunamis, SHI-MH has incorporated structural reinforcements and adopted structures which are less prone to effects of external forces, by analysing the shocks produced by earthquakes, and these countermeasures are proving to be effective. The demand for CSUs in the Japanese market is steady and with the changes and steady growth continuing in East Asia, ASEAN and India, SHI-MH expects expenditures for energy and infrastructure will also result in demand in this region. Further, the company expects this trend will prompt more Japanese companies to plan facilities in this region, generating further demand for CSUs in the future.